With this year's Usukicon here, you will want to make sure your Neopet isn't left looking drab. We have come up with five dazzling looks inspired by this season's best-selling Usukis, so that your Neopet can be the envy of Usukicon two-thousand nine! Not to worry, boys. If you love Usukis just as much as the next Neopet, we have also included a special look for you, too! Whether you prefer to dress your pet with Neocash or Neopoint items, we have lovely options for you to choose from. We have also included information on some special Neoboard avatars and NeoTitles, so that you can express your love for Usukis with other Neopians... in style! Does your Neopet often make heads turn? Does she break the bank with her undying love for expensive clothing? Do other Neopets envy her when she walks into a room? If so, the Prom Queen Usuki look will really make her shine! To achieve this look, we suggest sweet pink lipstick and pink blush for her pretty face. For a really attention-grabbing glow, have your Neopet take a few sips of a Sparkle Potion before going to the convention. She will be glittering all day long, guaranteed! A Pretty Miss Usuki dress from the NC mall is absolutely perfect for the occasion, and also matches the color scheme of the Prom Queen Usuki! 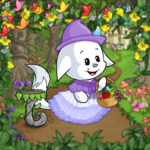 If your Neopet would rather a different color scheme, the NC mall offers quite a few dresses that would also compliment this look nicely. Tower princess shoes are the ideal finishing touch because they are stunning to look at and unbelievably comfortable while shopping at the convention. After all, they are made for a princess. Don't forget to secure your Neopet's hair in a stylish bun to tie the entire look together. 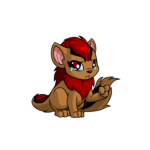 Guys, we have put together the perfect look for your Neopet! Become the heart throb of the Usukicon inspired by the Teen Pop Usuki! It is easy and hassle free, but you will be surprised at how many screaming fan girls will come running as you enter the convention. The Blue Argyle Shirt and Vest from the NC mall is luxuriously comfortable and quite close to the shirt worn by the Teen Pop Usuki. Black Utility Trousers will give casual flare to your getup while still making you look trendy! Style your Neopet's hair with a generous palm full of Frosty Hair Gel. If he prefers, draw on a goatee. Comfortable tennis shoes or poogle running shoes will finish the look! Though the summer is coming to an end, why not celebrate how much fun you've had by following a look inspired by the Fun In The Sun Usuki? This look is easy, and you can be sure you won't get too hot while browsing. Because there are so many wonderful bathing suits available, your pet has a plethora of outfits to choose from. A Yellow Tonu Swimsuit is best for blue or yellow Neopets, while a Pink Kacheek Bathing Suit is better suited for red or green Neopets. The right color makes all the difference! Boys will be pleased to know that there are also Quiggle Swim Trunks available! Remember to let your hair loose, and keep a pair of favorite sunglasses handy to finish the look. Want to go all the way? Roller Blades are sure to get you noticed! Does your pet constantly have her nose in a book? Does she love to spend an afternoon curled up studying instead of playing Key Quest? If so, the Schoolgirl Usuki is a magnificent choice for you! This look is quite easy if you're familiar with the NC mall, because there is a Superpack already available with the same theme! The Smart School Girl Superpack offers a Smart School Girl Shirt, Smart School Girl Skirt, Smart School Girl Shoes, and even a Smart School Girl wig and pair of glasses! If you do not feel like spoiling your Neopet so much, you can also go with the Neopoint alternative by purchasing the School Girl Shirt, Plaid Skirt, Shoes, Jumper and hat separately. Pull the look together with a Usuki Collectors Guide so you'll be shopping smart AND sassy! Now that you have everything you need to look your best for Usukicon two-thousand nine, there are a few things for you and your Neopet to remember. Usukicon is all about what you wear and how you wear it! Act the part and don't forget to buy lots of Usuki merchandise! See you at the convention! To be honest, he was sitting outside because he did not have an owner, a home, or even a place in the world. Annual Usuki Doll Convention: Oh to be a part of it!